Oh my! LOVE, LOVE, LOVE!!! That’s the most awesomeist tatoo I’ve seen in a long time. Lucky you! Adrian!! !Holy Cow, that tattoo is one of the awesome-est tattoo’s I’ve ever seen! Am looking forward to seeing what comes out of the new dye studio! Beautiful tattoo!! The mittens are nice as well. And I think I have the smallish spin dryer from that same company, and yes, it makes a GINORMOUS difference when dyeing. That spin dryer looks so cool – I never even knew they existed. Also a True Blood addict here. wow – that tattoo is beautiful! really lovely design. thanks for the update on the fiddlehead kits. i so want one. and true blood rocks. i heart vampires. This post has made me feel positively covetous! I want your tattoo, mittens and your clever spin dryer. That has got to be the most beautiful tattoo I’ve seen in a long time. Wow! I’ve never thought of myself as a tattoo person but your is totally blowing my mind and making me reconsider them! Adrian, that is the most awesome I’ve seen in quite a while. Just fabulous! I am also on the knitting blog shame train. I should make some time this weekend to take pictures. I think I have 3 projects that need to be blogged. Stupid lack of good light. That is such a kickass tatoo, very awesome. Cute mittens too! That’s the coolest tattoo I’ve seen, possibly ever. I love it. the mittens are pretty but the tattoo is gob smacking wonderful. i do have a penchant for tattoos though i don’t think i will ever get one. the house and neighbourhood sounds lovely. congrats. hope i will know about the fiddlehead mits in time. Looks like you have definitely kept busy. Your tattoo look amazing. :) I think I may ask for that spin dryer for Christmas. Awesome tattoo! I love it. 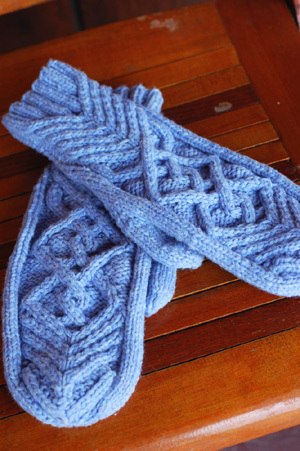 And the mittens are great too, just in time for cold weather. I say I won’t get a tattoo. Then I see yours and I think maybe I will. it’s just so amazing. I did not know there were bats in the theater. Pekarski’s is all kinds of goodness!! You’re so local now! And those mittens are amazingly yum. Yay! Can’t wait to see the club shipment! And all your other FOs, of course! I’ve seen many a tattoo in my day, but that is unquestionably my fave of all time! Wow!! fabulous. Can’t wait to see your other FOs. Your sink totally floats my boat! Marvelous mittens! Sounds like the new house and new town are treating you well. Man, I wish I had neighbors who made me baskets — that’s pretty sweet. Ack – what a gorgeous tattoo! That is just so, so beautiful. The mittens are scruptious skwooshy wonderful. I’m watching True Blood and am amazed. Love the tattoo. I mean LOVE it. Squirrels and acorns and mushrooms! c’mon, how cool. Love the mitts! Great color! The tattoo is beyond fabulous. ps I just received my order of BFL & Merino yesterday & I couldn’t be happier. I DEFFINATELY will be a return customer :) Thanks! I love those mittens! I am working on my first straded project right now to get warmed up for my Fiddleheads – can’t wait! And True Blood, omg, I’m addicted! I took a vacation day yesterday – stranded and watched True Blood for 7 hgours straight in my jammies! That was my favorite favorite! I love those mittens. I made a pair and I wear them almost every day, so cozy! By the way, the tattoo is beautiful, I’m completely jealous and now pining over one just like it. Yeah, I saw that on Flickr… “wool-drying basket.” I plead ignorance – how exactly does one use a basket to dry wool?!? The new tattoo is great. It’s charming without being twee. Very intriguing design. Nice tats! I’m thinking of getting one but the decision is a big one as I’m picky and want to be really happy with what I eventually choose. I’m working up the gusto to get my nose pierced now! Ah, True Blood – Mega Fan here! I don’t know what I’ll do when it goes on break…. Even Mom is warming to the tattoo. It’s a masterpiece! Goodness, I think you’ve kept yourself quite busy girl!! Hi Adrian – Just wanted to make sure you got my email with the change of address for the fiber club. I’d hate to miss out on what you have in store for us this month. I.LOVE.TRUE.BLOOD!!!!!! I am so addicted to that show. And your tattoo is absolutely gorgeous. Love love love the tattoo!!! Feeling the major league guilt around here, too, with projects in need of sharing piling up as well but absolutely zero light in which to photograph them and even less motivation to even try. And we all know how big a project moving and working on a house is, so please no worries, OK? As for the mittens, I’m loving how the plain palms are in such contrast to the more intricate cableyness of the backs. Oh my goodness, what a wonderful tattoo! I’m gearing up to knit those mittens myself. Wow, that tattoo is amazingly beautiful! So looking forward to the new club shipment and seeing all the new beautiful things you’ll be making in your fabulous new studio! Whee! Your new tattoo is just gorgeous. I’m so glad you all are loving your new home, too. Two very big steps that went with great success. Lucky you! The tattoo is absolutely amazing, congratulations! I’m scheduled for my first next September! That is one heck of a cute tatoo…. love it. Wow! What an amazing tattoo. dood! the club fiber is fantastic. it’s so beautiful and fall-y. Love the mittens, love the tat, and I’m so far behind on your blog I didn’t even realize you had moved. I’m a sucker for an old farmhouse (currently living in our third and hopefully final one), so I loved your pictures. The sink, ah I’m jealous of the sink. Did you ever have sign-ups for your Fiber club? Wow, that is an awesome tattoo, and so perfect for you! I’m glad you’re settling into your new home too. AMAZING tattoo! I love it, it’s really beautiful. very intricately and well done. 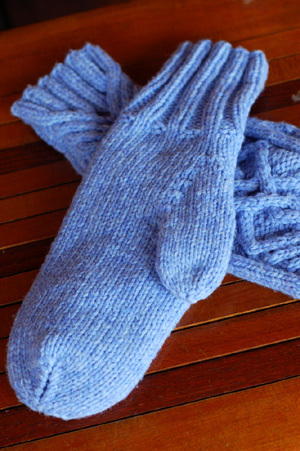 i’m not even usually a mitten person, but I LOVE those! That’s an awesome cable design. that’s an AMAZING tattoo! I love it, it’s really beautiful. very intricately and well done. What a gorgeous gorgeous tattoo!! !